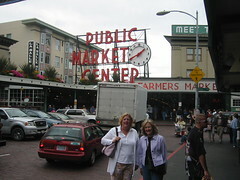 We went to Seattle today with Ellen. We visited the library, the market, the waterfront and the locks. I had not been to the new library yet. It is quite impressive. I like all the natural light coming in at many of the levels. The spiral floors of books are also unique. After a quick walk through the market, we headed for the Crab Pot on the waterfront. Esther had been looking forward to a crab feed for a while, so she thoroughly enjoyed the mess with bib and hammer. Ellen also shared in the barbarism, while I chose a more civilized culinary experience. We ended the day with a visit to the locks and fish ladders. Ellen gave us a great excuse to spend a day in the city. Thanks Ellen!